Over the past couple of weeks the weather has finally turned cold here in North Alabama. So of course, like clock work, we have been CRAVING soups, stews and chili. My whole family absolutely loves soup and grilled cheese! Not only is it delicious, but it is also frugal, which is important for those of us trying to save money for the holidays, this time of year. 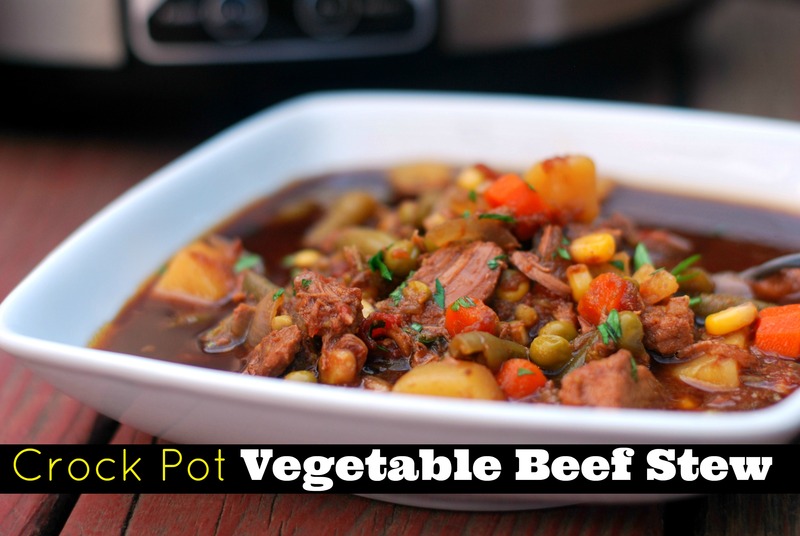 This Crock Pot Vegetable Beef Stew made enough for our family of 4 to have to 2 nights in the row for dinner plus enough for me to have for lunch one day too! Talk about stretching a dollar! This stew is so delicious. I love crock pot recipes that a) involve no precooking, just dump and go and b) Can cook on low for 10 hours, which is GREAT for moms that work outside of the home or just one of those days where we have to be gone for a long time. And this recipe passes BOTH of those tests! We had this one 2 days in a row but I am already thinking about making it again next week. Add stew meat, potatoes, carrots, onions, garlic, drained green beans, tomatoes with juice, corn, peas, onion soup mix, bouillon cubes, bay leaf, kitchen bouquet, Worcestershire sauce and water to the crockpot. Give it a little stir and and cook on low for 10 hours. Add salt & pepper to taste and sprinkle with fresh chopped parsley. Serve with grilled cheese! Enjoy! Try this Grilled Cheese, taken to a WHOLE NEW LEVEL! Not yet….. hopefully one day! I am SO GLAD you loved the Three Meat Chili! It’s one of our faves!